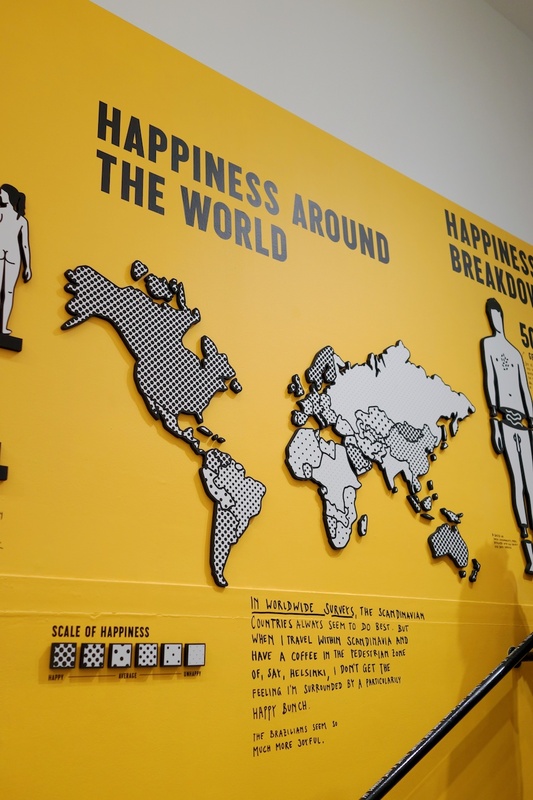 The Happy Show by Stefan Sagmeister is being shown at MOCA (Museum of Contemporary Art) in LA as of today (March 20th). Last night was a special opening and when I heard that Sagmeister would be speaking there, I had to attend. The show is open till June 9th. Stefan Sagmeister (left) runs his studio Sagmeister & Walsh in New York with Jessica Walsh (right). The work from the studio is a fascinating blend of art and design. The Happy Show started life at the Institute of Contemporary Art but is now being shown here in LA at MOCA. The show is best described as an “experience” of Sagmeister’s dissection and interpretation of what happiness is. I’ve been following Sagmeister’s work ever since I saw his TED talk, The power of time off. It's a must see. I was excited to see him talk in person but when I arrived, the line was already completely wrapping around the building. It was being held at the West Hollywood Library, across the street from the MOCA gallery. When people were let in, the auditorium became immediately full and my friends were still looking for parking. Strategically (but sadly), I decided go see the exhibition while everyone was trying to get into the library to see Sagmeister talk. When I arrived at MOCA, I was faced with another line but thankfully shorter than before. To help the time pass, the gallery gave out juice from the Pressed Juicery - it’s delicious. The uniform color palette of the exhibition is clearly evident as soon as you enter the exhibition. You also realize that every surface of the gallery has been altered by Sagmeister. Along with the clever graphic on the elevator doors, the up button is labeled “Adderall, Ritalin, Cocaine” and the down button, “Xanax, Valium, Percocet”. The entrance of the gallery is blocked by a monolithic yellow machine that dispenses simple advices on how to be more happy. These photos give you an overview of the show's aesthetics. The gallery is fairly small and it was packed like a can of sardines. It was too crowded to get any good photos but I tried my best. I love the black posters that say MONEY DOES NOT MAKE ME HAPPY. Watch the TED talk I mentioned earlier; there's a funny story behind them. “If I live in the US and make more than $80,000.00 per year, any additional dollar earned makes almost no difference whatsoever. Think about it, this is surprising: It does not matter to my overall wellbeing if I make $100,000.00 or $100 million a year; I will get rid of some problems but will add some others in exchange." Illustrations by the restroom. Even things like the humidity sensor are manipulated by the designer. I’m very rigid with my typography but I love the hand drawn type too. You can also see a variety of typographical experimentations by Sagmeister on the first floor. The stairway that takes you to the upper level has an amazing wall of charts, bars and graphs that illustrate happiness in different ways. The black/white on yellow remind me of the hilarious Tokyo subway posters. I particularly enjoy Sagmeister’s idea of taking 5 years of time normally spent in retirement and dispersing them throughout your working life. At the top of the stairway are ten machines that ask you to take a gumball that correspond to your happiness. I wanted to take a 7 but the machine was jammed. I took a six. Over time, it becomes a visual representation of how happy the visitors are. Next to the gumballs, Sagmeister shares his favorite candies from Indonesia called Ting Ting Yahe. They’re chewy, taste like starch syrup and have a spicy ginger kick. The second floor is dedicated to mostly interactive installations like this one. The spider webs fall apart when you walk past the projection. The center of the 2nd floor is occupied by this white bicycle that powers a typographic installation. 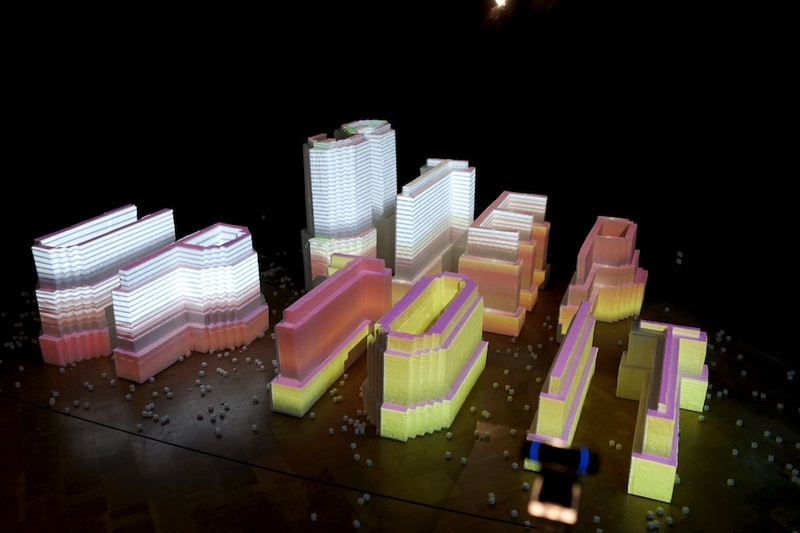 There’s also a projection mapping installation that changes color when the viewer smiles. There are a couple of projectors displaying more of Sagmeister’s experimentations. I highly recommend anyone in LA to visit the Happy Show. It’s an experience that can be enjoyed even if you are uninterested in design or art. Admission is free so you really have no excuse. I loved the experience but wish that it wasn’t so packed (and noisy) when I went. I’ll probably make a visit again when the crowds die down.